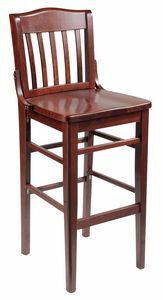 This classic school house bar stool comes in either mahogany or cherry. These are commercial quality chairs and built for restaurant use. They will work in many settings including your home kitchen. The bar stool shown above is finished in with a Mahogany stain. This bar stool is assembled in the USA using European wood parts. Because of shipping restrictions, we have a 4 piece minimum. Dims: 17" x 16" x 44.5"